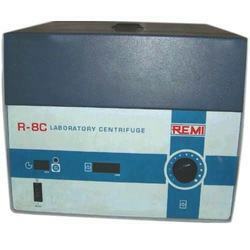 With the assistance of our dedicated team of professionals, we are providing a premium quality range of Remi R4C Centrifuge Machine. we are dealing REMI Laboratory Centrifuges suitable for routine sample analysis in Medical, Hospital, Pathology and Institutional laboratories. With a wide choice of rotor heads and adaptors, these units are truly versatile. - Digital Speed & Time control. - R 81 B head attached (8 X 15ml).